Our intention with this gathering is to inspire participants to find what lights them up and to share that more effectively with the world. We will be exploring Mind, Body and Spirit during these 4 days together including time in nature, lunch and dinner conversation, and workshops with global thought leaders. The base will be two heart-opening yoga classes per day as well as thoughtful, curated conversations and workshops. 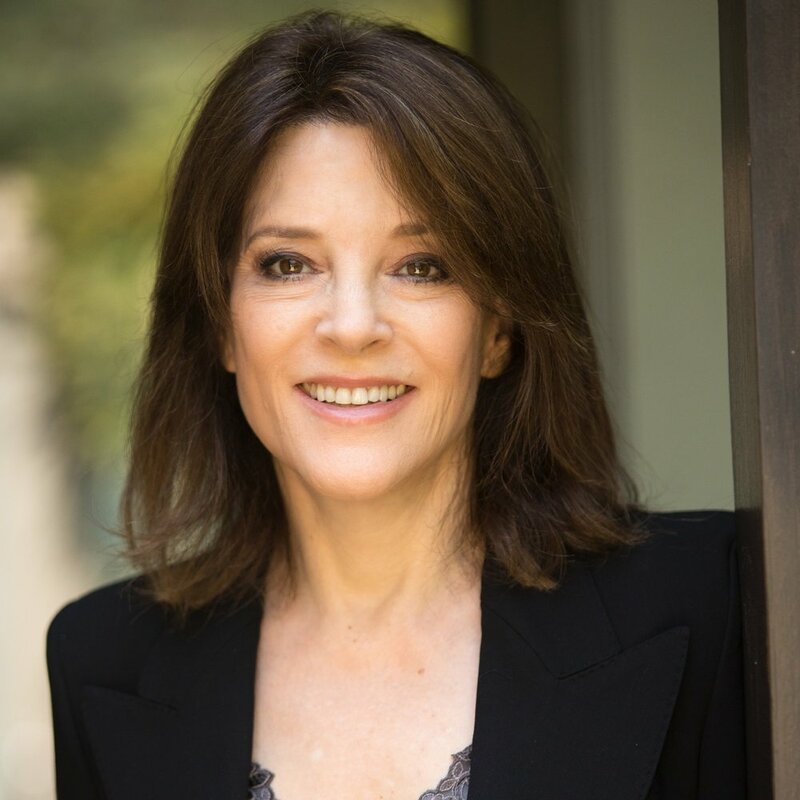 Marianne’s other books include The Law of Divine Compensation, The Age of Miracles, Everyday Grace, A Woman’s Worth, Illuminata, Healing the Soul of America, A Course in Weight Loss, The Gift of Change, A Year of Miracles, and her newest book, Tears to Triumph: The Spiritual Journey from Suffering to Enlightenment, available now. Deepak Chopra is one of the leading mind-body spirit Gurus. He seeks to teach the benefits of incorporating meditation and a healthy lifestyle for increasing inner happiness. Deepak was born in New Delhi, India in 1947. He attended the All India Institute of Medical sciences studying western medicine. In 1968 he came to America and began working in a New Jersey hospital. This led to a successful career in medicine in which he became chief of staff at the New England Memorial Hospital. He also established a growing private medical practice. During this time Deepak Chopra says that he used to smoke a packet of cigarettes a day and also he used to drink heavily to calm his nerves. Increasingly he became uneasy at his approach to life and also he became aware of the limitations of Western medicine. He felt there was something missing in his approach to medical care. Therefore he increasingly became interested in Ayurvedic medicine, which stresses a more holistic approach to medical care. His main teaching and beliefs are that to attain happiness we need to consider several things. Firstly we should find time for meditation and silencing the mind. This helps us to avoid negative emotions and thoughts. Deepak stresses that negative emotions are like toxins just like bad food could be. He also teaches that we should try to listen to the signals of our body and develop our intuition. With regard to physical health he says there is a close connection between our physical health and our state of mind. This is why he is often associated as one of the pre-eminent leaders of the mind body spirit movement. To improve physical health he says we should be very careful about what we eat. Also if we can eat in the right consciousness then it will help. Deepak Chopra has had over 42 books published selling over 20 million copies world wide. His books range from translations of the Sufi poet Rumi to “A Holistic Guide to Pregnancy and Childbirth” As a public speaker he is also in great demand and has appeared as a keynote speaker at many prestigious events including the inauguration of the State of the World Forum, hosted by Mikhail Gorbachev. Dr. Chopra is a fellow of the American College of Physicians and a member of the American Association of Clinical Endocrinologists. Seane Corn is an internationally celebrated yoga teacher known for her impassioned activism, unique self-expression, and inspirational style of teaching. Featured in commercials, magazines, NPR, and Oprah.com, Seane now utilizes her national platform to bring awareness to global humanitarian issues, including HIV/AIDS prevention, and was awarded the “Global Green International Environmental Leadership Award” in 2013. Since 2007, she has been training leaders of activism through her co-founded organization Off the Mat, Into the World®. Seane has spent time in the US, India, Cambodia, Haiti and Africa working with communities in need. Her most recent dvd series “The Yoga of Awakening” can be found on Sounds True. She is currently working on her first book. John Paul DeJoria co-founded Paul Mitchell in 1980 and helped turn it into the world's largest privately owned salon haircare company. He went on to co-found Patrón Spirits Company, John Paul Pet & JP Selects — all privately held companies with high ethical standards and reputations for integrity. John Paul signed the Giving Pledge in 2011 as a formal promise to continue giving back. That same year, he founded JP’s Peace, Love and Happiness Foundation to invest in charities that share the core values of his companies -- sustainability, social responsibility and animal-friendliness. John Paul believes that success unshared is failure. To that end, the DeJoria family is committed to contributing to a sustainable planet through investing in people, protecting animals and conserving the environment. Visit JP's Peace Love + Happiness Foundation website here. Elevating personal growth as a lifestyle, Ashley Turner, M.A., MFTI (#62103) is a yoga/meditation teacher, registered Marriage + Family Therapist Intern, writer, speaker and Initiated Priestess. Deep, witty, and laser focused, she draws on the source texts of yoga while incorporating the best of neurobiology, Jungian Psychology, ayurveda, tantra, shamanism and priestess work – vigorously challenging students and clients from the inside out. She is known for her ability to translate complex themes into practical, real-life tools accessible to all. As the Artist-in-Residence at Montage Laguna Beach, Ashley launched Montage’s signature monthly yoga–mind–body workshops. Ashley is a sought after presenter at international events and conferences and contributor to top tier media publications including Self, Shape, Mantra, Origin, Women’s Health, Yoga Journal and Natural Health. She focuses on a dynamic vinyasa style of yoga infused with nuggets of wisdom from the roots of Yoga Psychology and philosophy, deep self-inquiry, devotion and humor. Gina's passionate and inspirational style of teaching is called Integrated Vinyasa which emphasizes the fusion of alignment and flow, anatomy and energetics, focus and release, work and play. She came to the mat from the office chair so has a keen ability to really speak to the modern-day householder yogi. She is an inspiring, empathetic teacher known for her clear and playful style of encouraging you to fearlessly navigate your edge, open your heart and boldly dive in! She is driven by the recognition that embodied, creative movement and self-exploration are essential methods of conscious evolution and discovering one's limitless potential! Through their diligence, enthusiasm, sustained effort, and firm belief in Soul-Centered education, the Hulnicks have co-created a dynamic educational institution (at the University of Santa Monica) emphasizing relevant, usable information, skills, and experiences designed to support each student in the revelation of their Authentic Self, as well as a greater demonstration of mastery and excellence in their lives. Over time their dream of education for the whole person has resulted in Graduate Programs operating on the leading edge where psychology interfaces with spirituality. When Hollywood marketing executive Scott Neeson embarked on a sabbatical between jobs in 2003, he couldn’t have imagined how it would change his life. In Phnom Penh, Scott saw hundreds of children and their families living and working on the Steung Meanchey garbage dump, one of the most toxic environments imaginable. It was a moment that changed his life. Soon after, Scott made the decision to resign from his job, sell all of his possessions and focus his energy and passion into Cambodian Children’s Fund. Twelve years later and Scott’s journey still captivates, inspires and bewilders people from all over the world. Suzanne has been a featured artist/teacher at numerous festivals and conferences such as, Wanderlust, Omega, Esalen, Kripalu, Yoga Journal, Hanuman, Burning Man, Symbiosis, Ecstatic Dance, Bhaktifest, Boomfest, LIB, Earthdance (where she led the worlds largest Spiral Dance for 5000 people) and many more. She has been guest teacher in numerous Yoga Teacher Trainings and for 7 years has been part of the nationwide faculty for YogaWorks Teacher Trainings. Eddie Stern is an Ashtanga yoga teacher raised in New York City. He studied with Sri K. Pattabhi Jois of South India from 1991 until Jois' death in 2009. He runs a yoga school in Soho called Ashtanga Yoga New York. The Urban Yogi Program was started in collaboration with Erica Ford (Peace Is A Lifestyle) and Deepak Chopra in 2012 in an effort to address violence reduction in South-East, Queens. Eddie serves as the Program Director, teaching yoga, sanskrit, philosophy and serving as an important mentor in the lives of the Urban Yogis. Tabay is The Youngest Certified Yoga Teacher in America. He finished his 200 Hour Intensive Vinyasa Yoga Teacher Training one week before his 11th birthday Tabay has joined his mom, Sahel, on a long list of specialized Yoga Teacher Trainings since he was 7 years old. 200 Hour Vinyasa Yoga, Circus Yoga Ring 1 & 2, Yoga for Kids, Yoga for Tweens and Teens, and Yoga for Autism Spectrum. He is Homeschooled and teaches weekly teen and adult Donation Based Vinyasa Yoga Classes at his moms yoga studio, CARE4YOGA, in San Clemente, California. He donates 100% of the money he makes to Kids who have Cancer. He also helps his mom teach her kids yoga classes. In addition to studio classes, he teaches private lessons at clients homes, and teaches with his mom and does special workshops all over the world. Tabay's journey with Yoga started at the same time his mom's yoga journey started. Sahel was just 2 weeks cancer free when she started a 200 hour vinyasa teacher training, and he was by her side every step of the way. After having cancer and going through chemo treatments, she could barely walk on her own. She was sad, scared and worried. Tabay noticed that after doing yoga, it helped her regain her physical strength and helped her feel better emotionally and mentally as well. He knew then and there that he wanted to become a yoga teacher so that he could help others heal with the practice of yoga the way yoga helped heal his Mom. Tabay had a choice at the end of 5th grade to either go on a fun, summer vacation to Europe or take the teacher training. And, as much as he loves to travel, he chose to take the intensive teacher training so that he could start helping people right away. Tabay's passions are Yoga, Legos, Baking, Traveling, and Collecting Coins. His dream is to teach and share the benefits and lifestyle of yoga to everyone that he possibly can, all over the world. He feels that the more people that know about yoga and practice it, the better our world will be. He is a true definition of what yoga is.